On Saturday 3 February 2018, the legendary Yodsanklai Fairtex will make his return back in the ring against against Enriko Kehl at Wu Lin Feng in Shenzhen, China. Yodsanklai Fairtex, one the most recognized Muay Thai fighters in the world, is coming out of retirement. Holding an impressive 26-fight win streak dating back from 2012, the legendary Yodsanklai will make his return back in the ring against the German native: Enriko Kehl. The two southpaws will square off at the Chinese kickboxing promotion “Wu Lin Feng” (WLF) in Shenzhen, China on Saturday 3 February 2018: an event organised and televised by Henan Television. 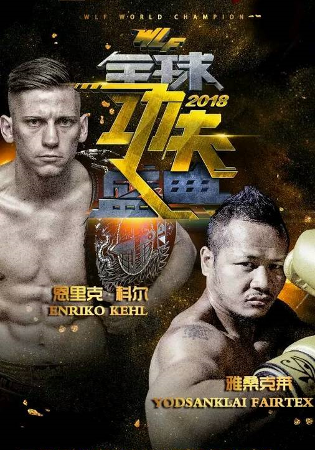 The match was initially scheduled and promoted to be featured on the card of “Kunlun Fight 69” to be held in Guiyang, China only one day later. Other noticeable fights on the card are: Yohan Lidon (France) vs. Regian Eersel (The Netherlands) at 77kg and the fight between Singdam a.k.a. “The Black Lion from Buriram” (Thailand) vs. Xie Lei (China) at 67kg. Having to take time off throughout 2016, after facing a series of knee and hamstring injuries, Yodsanklai came back with multiple victories at events in China since February 2017. With promotors already working out a much anticipated bout against fellow Muay Thai legend Buakaw Banchamek, fight fans around the world were devastated when “Yod” announced on Facebook that he would be retiring from fighting back in June, 2017. The motive of the veteran fighter, aged 31 at that point of time, was the persistent pain he experienced during training. Luckily, after plenty of physiotherapy and rehabilitation, Yodsanklai Fairtex is back in shape and ready to continue his fighting legacy. Training out of Fairtex Gym in Pattaya, Thailand, Yodsanklai holds and impressive kickboxing record of: 197 wins (77 by K.O. ), 71 losses and 4 draws. He is three times “Lumpinee Stadium Champion” in weight classes 112lbs and 147lbs. He is the former super welterweight “WBC Muay Thai World Champion” at 154lbs and the first “The Contender Asia Champion”, amongst many other titles. Thai sports newspapers have nicknamed him “The Boxing Computer”, because of his intelligent fighting techniques. His opponent, the 25-year old Enriko “The Hurricane” Kehl has risen through the ranks going into the fight with a record of: 42 wins, 13 losses and 1 draw. The German became known for both of his fights against Buakaw Banchamek and becoming “K-1 World Max Championship Tournament Champion” in 2014. Before that he was “I.S.K.A. Middleweight World Champion” in 2013 and “I.F.M.A. Europa Cup Muay Thai Champion” in 2012. A win over the legendary Yodsanklai Fairtex would be a giant feather in his cap for the young Enriko Kehl. Nonetheless, Yodsanklai will be very driven to uphold his 6-year long winning streak, in order to not regret his return from retirement. What else it at stake? Surely, the victor of this bout will increase his chances to be scheduled first for a match up against mutual rival Buakaw Banchamek, don’t you think? We are looking forward to a great fight!